Shane Adams, owner of Bear Creek Bicycle Company in Dalton, talks about closing his shop on Thursday because he cannot compete with internet sales. DALTON, Ga. — Shane Adams had just sat down in a chair outside his office to explain the mission of Bear Creek Bicycle Co. when he began to stand up again. "Hold on a second," Adams said. "Let me run and grab something." 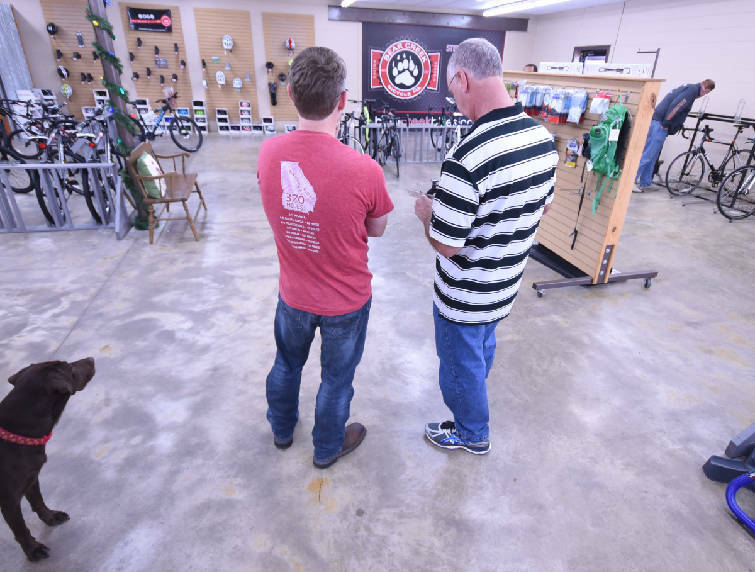 Adams hasn't had the luxury of sitting still for long since leaving a teaching job at Dalton High School nearly 10 years ago to open the bicycle shop he had envisioned since he was a teenager. On Tuesday, Shane Adams, left, talks with Jim Raisin, a friend who helped Adams start his business in 2007, about closing his Bear Creek Bicycle Company in Dalton. According to Adams, trying to compete with internet sales has driven him out of the retail business. Things were no different Tuesday, even though his shop is closing forever Thursday. He checked in with a customer and then returned to his chair with a poster of the thought he was trying to convey. Above a picture of a bicycle on the poster was Bear Creek's mission statement, which ends with a call for the shop to be "the hub for the Dalton cycling community." The outpouring of support he has received since announcing last Friday the shop is closing indicates to Adams that Bear Creek accomplished that mission during its nine and a half years in business. But the store, while revered for its customer service, could not compete with the internet any longer, Adams explained to customers who stopped by Tuesday afternoon to say goodbye to him, his team and their store on West Walnut Avenue. The business is running more smoothly and efficiently than ever, but is still not operating competitively, he told one well-wisher. "Whenever you see that, you know it's time to go," Adams said. "I am fighting, in my opinion, an unwinnable fight. I am not bitter or angry. I don't begrudge people for shopping on the internet, because we all do it. I don't blame them for making a fiscally sound decision, but I am having to make a fiscally sound decision myself. And that means I am having to move on." Adams got teary-eyed a few times while explaining Bear Creek's circumstances and what he'll miss about the shop. But he said he has made peace with the move, that he fulfilled a childhood dream by operating the store, and that he and all the shop's employees have new jobs lined up. "I can walk out with a clear conscience," he said. 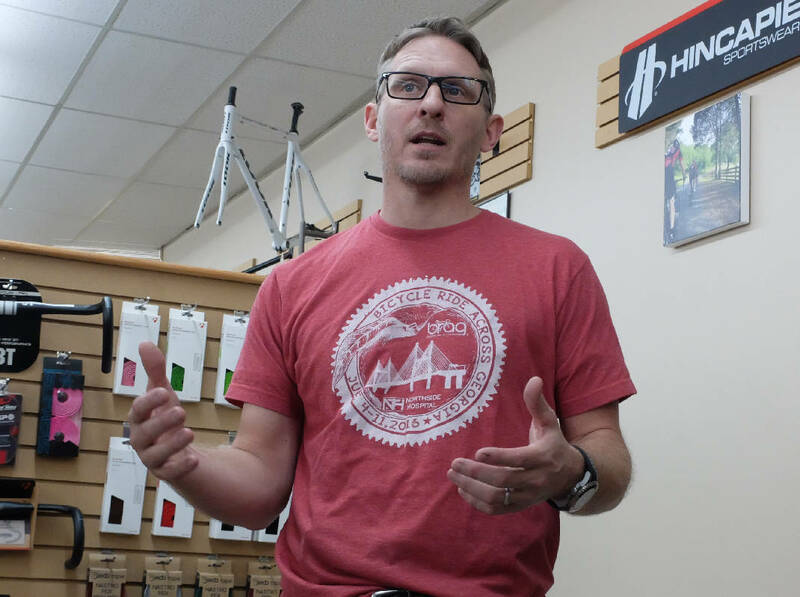 Customers said Dalton's cyclists likely will have to shift their allegiances to Chattanooga bike shops, but agreed it's unlikely that any place could fill the role that Bear Creek played in the community. "This basically decimates the mountain biking and road biking community," Dalton resident Derek Kozlowski said. "Bear Creek has been a critical part of both of them. You've seen an explosion in the road biking community in Dalton. You used to see groups of two or three riders. Now there are groups of 100 riders going out. "Bear Creek was a big part of that. Losing that, it's going to be a big hit to the biking community in general." Kozlowski is the director of the annual Trans North Georgia Adventure, which takes endurance riders more than 300 miles from Georgia's border with South Carolina to its border with Alabama. Bear Creek has been a staple of that race, offering racers a place to stop and tune up their bikes before trudging out for the race's final stretch. The shop's supporting role in that event is just one of many functions beyond selling and servicing bicycles that it has served since opening months before the Great Recession. Adams and his well-wishers reminisced Tuesday about how the store served as a community hangout that turned customers into friends. At times, the shop was even a yoga studio and a meeting place for Bible studies. Most of all, it fulfilled the mission statement that its owner decided on years before the store ever opened. The one that concluded with the mission of being a hub for the town's cycling community. "He's done so much for the biking community," customer Mark Joyce said. "He created a biking community in Dalton and serviced it, too. It's been a family."